In 1258, a Mongol army numbering between 120,000 and 150,000 soldiers laid siege to and sacked Baghdad, then the capital of the Abbasid Caliphate and the center of Islamic power. 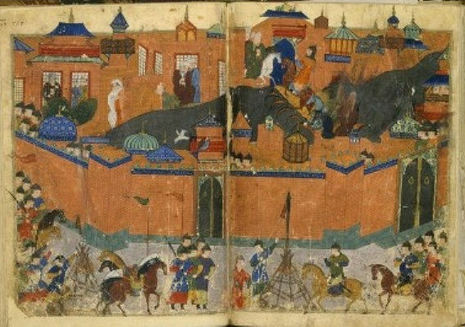 The Mongol army, led by Hulagu (also spelled as Hulegu) Khan and the Jalayir general Koke Ilge and the Chinese commander Guo Kan in vice-command, set out for Baghdad in November of 1257. Hulagu marched with what was probably the largest army ever fielded by the Mongols. By order of Mongke Khan, one in ten fighting men in the entire empire were gathered for Hulagu's army (Saunders 1971). The attacking army also had a large contingent of Christian forces. The main Christian force seems to have been the Georgians, who took a very active role in the destruction. According to Alain Demurger, Frankish troops from the Principality of Antioch also participated. Also, Ata al-Mulk Juvayni describes about 1,000 Chinese artillery experts, and Armenians, Georgians, Persian and Turks as participants in the Siege. Some historians believe that the Mongol invasion destroyed much of the irrigation infrastructure that had sustained Mesopotamia for many millennia. Canals were cut as a military tactic and never repaired. So many people died or fled that neither the labor nor the organization were sufficient to maintain the canal system. It broke down or silted up. This theory was advanced by historian Svatopluk Souček in his 2000 book, A History of Inner Asia and has been adopted by authors such as Steven Dutch.